Cataracts: As with glaucoma, the risk of cataracts is more common in those with diabetes as well – 60% higher. 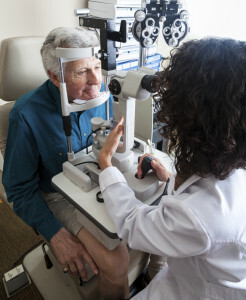 Diabetics also typically are diagnosed with cataracts at a younger age than those without diabetes, and the progression is generally faster, too. Mild cataracts can be managed through wearing sunglasses and glare-control lenses, while more developed cataracts may need to be removed. Retinopathy: This broad term covers all disorders of the retina caused by diabetes, including non-proliferative retinopathy (the most common form, in which pouches form in the back of the eye) and proliferative retinopathy (where blood vessels close off due to damage, resulting in new, weakened vessels leaking blood). A number of treatments are available for both conditions, and as with other eye conditions, the sooner they’re treated, the better the prognosis. For those with diabetes, maintaining a schedule of preventative care eye exams is imperative, as many issues are much more easily treated if caught early. At Hired Hands Homecare of Marin, CA, we understand how overwhelming diabetes maintenance can be. Our expert caregivers can provide meal planning and preparation assistance to ensure seniors stick to prescribed diets, assist with medication reminders, and much more. If you are in Marin, Sonoma, or Napa County or the Tri-Valley area and would like to learn more about our home care services or our excellent caregivers, call us at 866-940-4343 or contact us online today!